Williamsport, Maryland highlights this section of the towpath. The town was a major inland port during the canal heydays. Today, the town is mostly just an exit off Interstate 81. However, it still supports a pretty sizable residential population and several small businesses. As a result, a number of convenience marts and restaurants are available here. 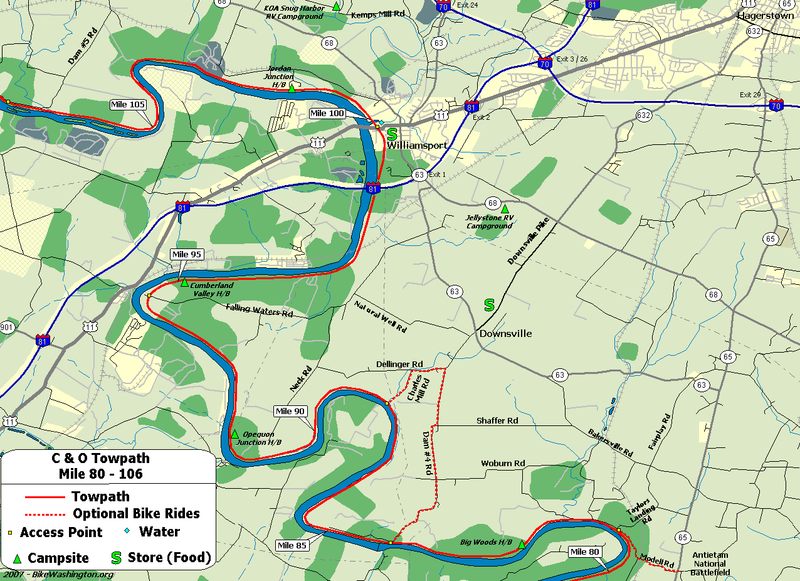 Just north of Williamsport lies the Conococheague (Con-ni-ca-jig) Aqueduct. In 1920, the upstream wall of the aqueduct collapsed after being struck by a canal barge. The barge crashed through the opening and remained stuck in the creek until 1936, when a flood washed it down the Potomac. A wooden wall was hastily reconstructed in order to get the aqueduct back in service. This fix remained in place until the canal ceased operation 4 years later in 1924. Instead of digging out the canal between Mile 84 and 88, the builders instead routed canal boats onto the river, with the towpath built along the river bank. Dam #4 created the area known as Big Slackwater that made this possible. Over time, river erosion caused the towpath to eventually disintegrate. Thus for many decades, the Big Slackwater section was impassable, requiring a lengthy on-road detour. This changed in Fall 2012, when a nearly two year reconstruction project finally closed this breach. As a result, we now have a completely car free trail between DC and the Pittsburgh area! There are two really nice RV Campgrounds located just southeast of Williamsport. If you would like to "Park and Ride", then this makes a great starting point. You can park your RV here and then spend one or more days exploring the towpath. For RVers wishing do the entire canal, you can spend a few days covering one half of the towpath, return to your RV for an evening or two, and then spend a few more days exploring the other half. Take I-81 Exit 1, turn onto Route 63, following signs AWAY from Williamsport. Large parking area at end of road. Take I-81 Exit 2, onto US 11 South (E Potomac Steet) following signs toward Williamsport. At Exit 18, take Route 68 South, making a left at the end of the ramp. Continue about 3 miles to the parking area. 94.3 Falling Waters Confederate Army crossed here after the Battle of Gettysburg. 99.5 Conococheague Aqueduct Pronounced KAH-no-KAH-cheek, the number five aqueduct was completed in 1835. Notable for the missing upstream wall, which collapsed on three different occasions, most recently in 1920. Major restoration to begin July 2017 with 1 mile detour.